Nov 19, 2018 • Urbanization is an important driver of change across our home planet. With over half of the world’s population living in urban areas today, the mapping and monitoring of urbanization is critical to understanding these changes and their potential impacts. The availability of high resolution, free satellite imagery from the Landsat archive provides great opportunities to map global man-made surfaces and urban extent in unprecedented detail. 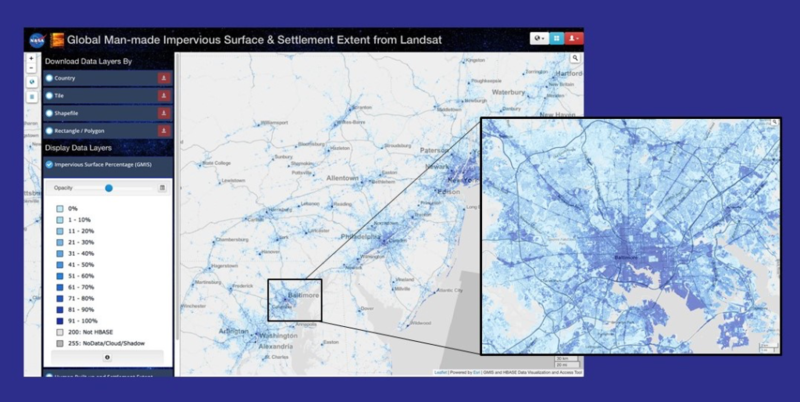 NASA EarthData has produced two global urbanization companion data sets from the U.S. Geological Survey (USGS) Global Land Survey (GLS) Landsat archive using reference data from the unclassified commercial satellite archive of the National Geospatial Intelligence Agency (NGA) and machine learning techniques, now available through NASA’s Socioeconomic Data and Applications Center (SEDAC). This webinar described the production of the Global Man-made Impervious Surface (GMIS) dataset and its companion urban extent dataset called the Human Built-up And Settlement Extent (HBASE). These datasets provide estimates of global impervious cover and urban extent at a common 30m spatial resolution for the target year 2010. The webinar also demonstrated the use of data access tools developed at SEDAC for flexible and efficient access to this large global data set. This entry is filed under Data, News, Video.